What it’s about: Pierce Oliviera was only dead for a few hours, but it’s changed the course of her life. Most people with near-death experiences come back different, but Pierce came back against the will of a death deity who had hoped to spend eternity with her and now she’s being pursued by Furies bent on hurting the one person that deity loves. Now all kinds of strange things have been happening and after that “incident” with the teacher, Pierce and her mother have moved down to Florida to be closer to her mother’s family. Pierce is hoping it will be a new start . . . but it’s unlikely as Isla Huesos is where she first met John, the keeper of the Underworld who’s been popping up as her guardian since the day she died. 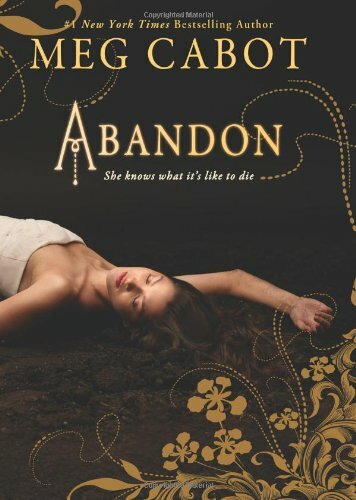 Abandon is the first book in an upcoming trilogy that retells the myth of Persephone, the woman who finds herself the unlikely consort of Hades, forced to spend half her time in the Underworld and half her time with her mother on Earth. Meg Cabot drops Hades for a young and handsome “death deity” who’s more of a gatekeeper than a god, and places Pierce in high school. The concept sounds great, but I’m sorry to tell you that the execution did not impress. My biggest issue with Abandon was the structure. A lot of really exciting things happen to Pierce–she drowns in the family swimming pool, descends to the underworld, is attacked by demonic Furies in the guise of trusted friends–but none of these things happen in the present. Every single one of the exciting things in the novel are told through flashbacks, completely eliminating any suspense or narrative tension. This decision to place all the action in the past, and to retell it to the reader through extended flashbacks, essentially castrates the story. Never once did I feel worried about Pierce, never once did I experience any sense of urgency or struggle. And that’s a big problem in a book about death. The action that happens in the present is tame and honestly a bit boring. It’s a lot of feelings–Pierce wondering if she’ll fit in, Pierce thinking about the past, Pierce scheming to “protect” those around her. But what is Pierce doing? Very little. Hopefully the next book with introduce the action into the present. Cabot has got a great concept on her hands and some excellent source material to mine, but she’s doing herself a disservice by not showing Pierce in action and by not allowing the reader to fear for Pierce’s safety or fret over her future. I wanted more gothic fury and mystery and less teenage navel-gazing. Would I recommend? I can’t say I would. The potential of the novel was lost, in my opinion, by putting the action in the past. There is only one scene where Pierce is in danger in the present and you have to wait about 315 pages to get there. Pierce needs to get out of her head and into action in the next installment.